We were grocery shopping at Tesco that day. It was rather late in the afternoon and we can't decide what to eat. 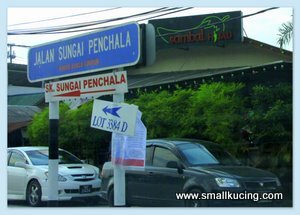 Then Papa Recalled that there was a Malay restaurant that was featured in television show some time ago. Hence we went and hunt for it. Found it. Although it was rather late in the afternoon, there were still many customers there. Very large selection of dishes to choose from too. Mamarazzi too Kerabu Mango, Fried Egg, a bit of spinach and a stuffed Squid. 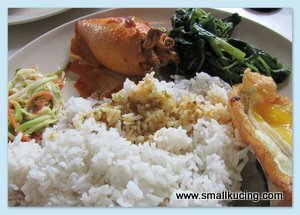 The rice was RM2, kerabu was RM1, Egg RM1 and spinach RM1. But this little fella cost RM6. And it is worth every sen coz the squid tasted delicious. Fresh and bouncy. My plate of plain rice. RM1. Eat with hand are the best. 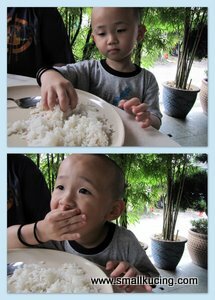 Papa's plate of rice. Rcie RM2, the vegetables RM3.50 and the Squid was RM7. Had the famous grilled fish. RM9. Taste pretty good. Not that expensive. 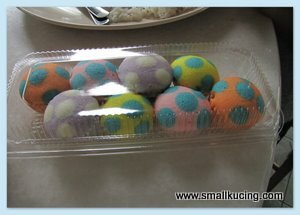 Saw on the tables, they have put some cakes and Kuih.Bought a packet of these pokka dot muffins. RM3. 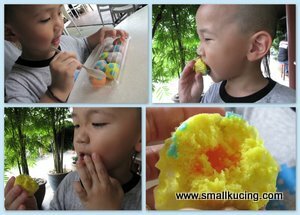 Ngap....mmm....I like the Cake part but I didn;t like the syrup inside coz to me it taste like cough syrup. Here is the address. Do try out their Grilled Fish and Squid. 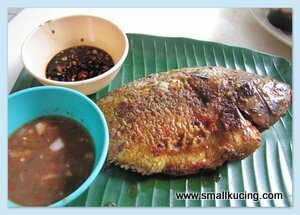 Ooooo...the kind of food that I love, never mind that the sotong is so expensive. Once in a while, ok lah. I've never had squid, but it does look good. And I definitely want some of those polka dot muffins! Why the stuffed sotong have different prices? Depends on the size? 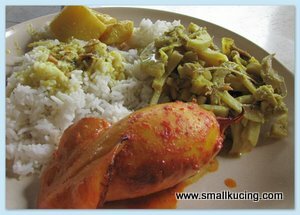 My kind of food and I have this high weakness for Malay food though my other half tak boleh tahan Malay dishes. The stuffed sotong seems made to perfection and very nice.